Chocoholics listen up! 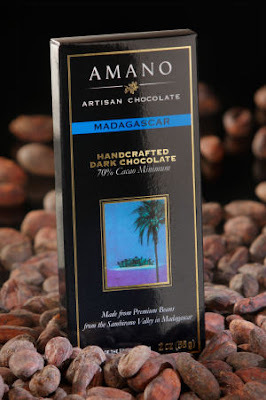 Amano Artisan Chocolate has some delicious bars that will satisy that sweet tooth of yours. Years ago, I ate a chocolate bar every day. It was a bit of an addiction of mine. I have since cut back, and now only enjoy it every once in awhile (ok maybe a bit more around the holidays). What I like about Amano Artisan Chocolate is that their focus is on quality of flavour rather than on quantity. They make their chocolate slowly and in batches to ensure that the final product is top notch. They compare chocolate tasting to wine tasting. Chocolate has both rich and complex flavours that are meant to be savoured. Their website is an awesome resource where you can learn so much about chocolate and its unique properties. I feel much more informed now about my favourite treat! Amano Artisan Chocolate sent me some of the bars to try out. They were Dark Chocolate although they do make Milk Chocolate. I like Dark Chocolate, but not as much as I like Milk Chocolate. But chocolate is chocolate and its all good! Each bar was from a different area of the world so the beans have a distinct flavour depending on where they are grown. The Madagascar bar is made from beans from the Sambirano Valley in Madagascar. Its mild with notes of citrus, raspberry and raisin and there is nothing added. Just pure chocolate. You can read up on all the bars and their unique properties and learn more about how they are made in each of the countries. All the bars were tasty and had a superb chocolate flavour. Some of them were stronger than others. My favourite was the Madagascar bar which has 70% Dark Chocolate. It is not a bar you could eat in one sitting because the chocolate flavour is strong. One or two pieces is enough to satisfy my craving. Normally, I binge on the whole bar so at least this way I am not overdoing it. It is a bit more expensive than you would pay in the store for a regular chocolate bar ($6.95). But you are paying for the high quality and refined flavour so if you are a chocolate afficinado, it is something you will enjoy. 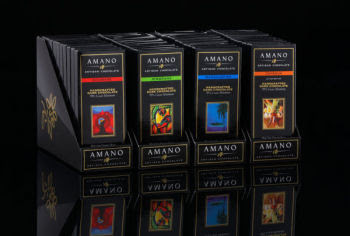 Visit Amano Artisan Chocolate and browse their selection of chocolate bars and see what one you would like to try!